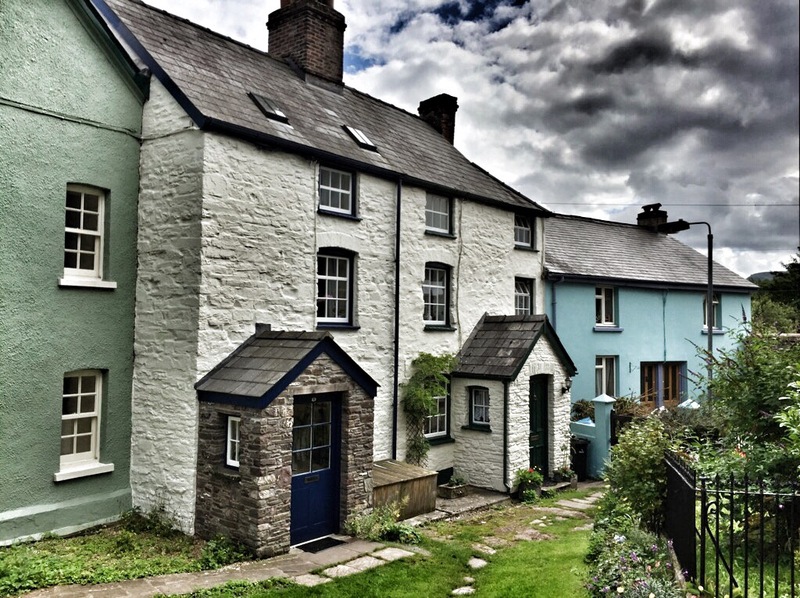 Brecon town nestles in the shadow of the iconic Pen-y-Fan, the highest point in South Wales. The Welsh name is Aberhonddu, and is the meeting point of the rivers Honddu and Usk. Now it’s not a large town by many standard with a population of just over 8000 worthy souls. But it is an old town, and like many old towns it is full of surprises. Recognising it’s strategic position the Romans built a fort near here. Then the Normans followed almost a 1000 years later and continued to dominate the area with a castle. Not only does it have history, a fantastic view of the Brecon Beacons, a canal but also a cathedral. One thing we do. well in Wales is having Hugh cathedrals in small towns hidden from the world. 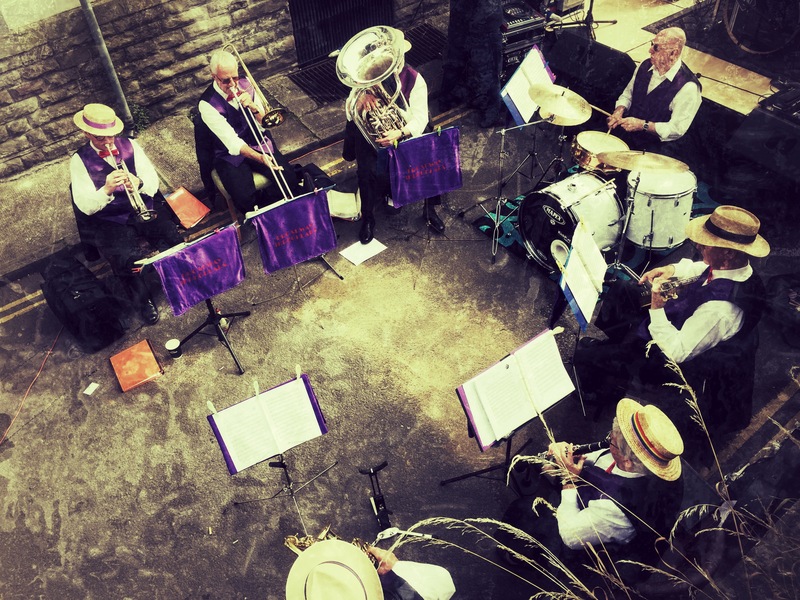 But we weren’t here for teh history this time but to sample Brecon Jazz Festival. This has been a long time coming, as we’ve been saying for the past 25 plus years “We must go the the festival this year”, but never made it. We stayed just outside Brecon, and the walk along the canal into the town set the scene well. Now I do have a small confession to make. We were too tight to pay the almost £100 for the festival tickets themselves, especially as we are not big fans of jazz. Yes, I know it may be a difficult to thing for some to confess, but at least I do have a couple of Miles Davis albums, including A Kind of Blue (which I do like). 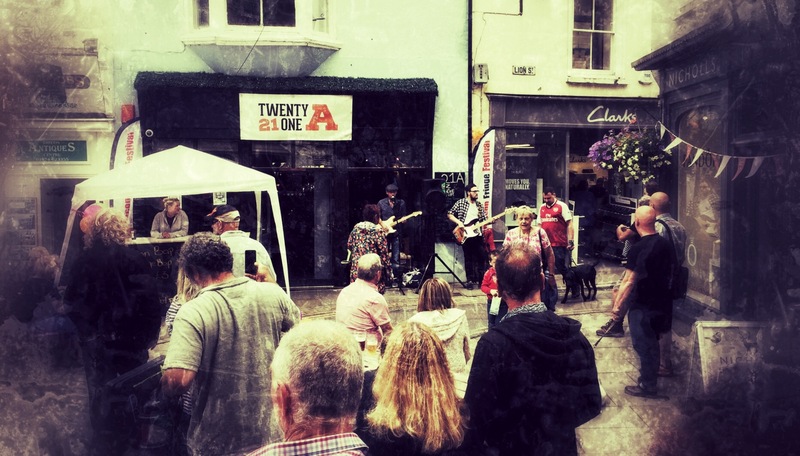 The festival started in 1984 when Jed Williams, owner of The Four Bars Inn organised a series of gigs. George Melly, who had a house close by, performed on the first weekend. After that it took off big time, and many of the biggest names have played in this small, out of the way town. And despite funding challenges a couple of years ago in the depression it continues to attract large audiences. So, if we didn’t attend the main festival what did we do? Well, the whole town is given over to music for the weekend, and there is a whole fringe element going on. 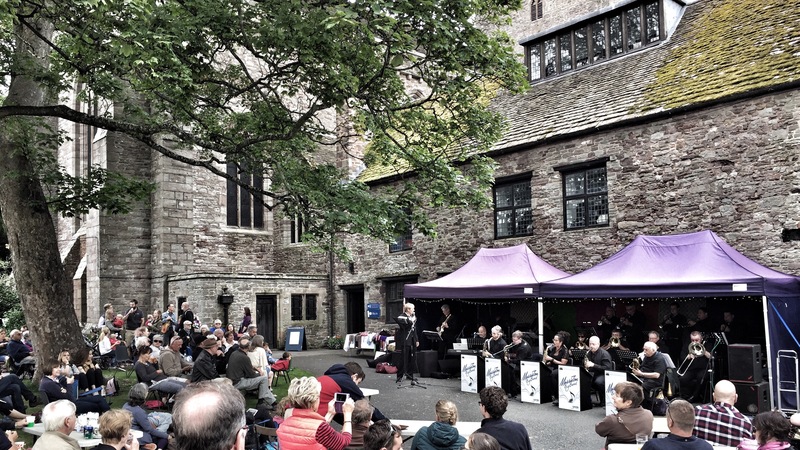 There is a main stage in the centre of the town where jazz ensembles share the stage with local choirs. But more importantly all the pubs have a full program of groups and solo artists to singing everything from folk, rock, pop and wells as jazz. A perfect excuse for visitin a few drinking houses. I like that idea! 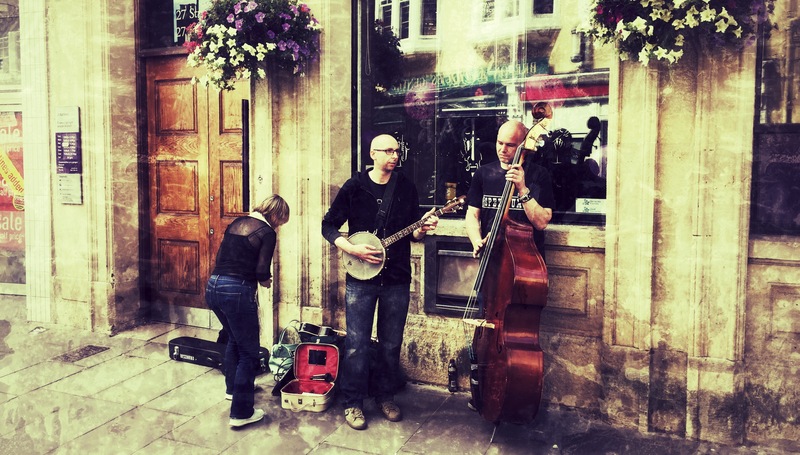 The pubs weren’t the only places where you could hear and feel the vibe. Around every corner you’d come across another surprise. Not to be outdone the cathedral choir were also sing their hearts out, though this was a practice for a formal service performance. But outside in the priory gardens the jazz performances continued. It was difficult to avoid music, but why would you. The eclectic mix meant that it would be difficult not to find something you’d like. I like Breacon as a town, and there is always something that surprises me around one of the corners. The small group of houses, just below the cathedral, seems to have been left behind in time almost. 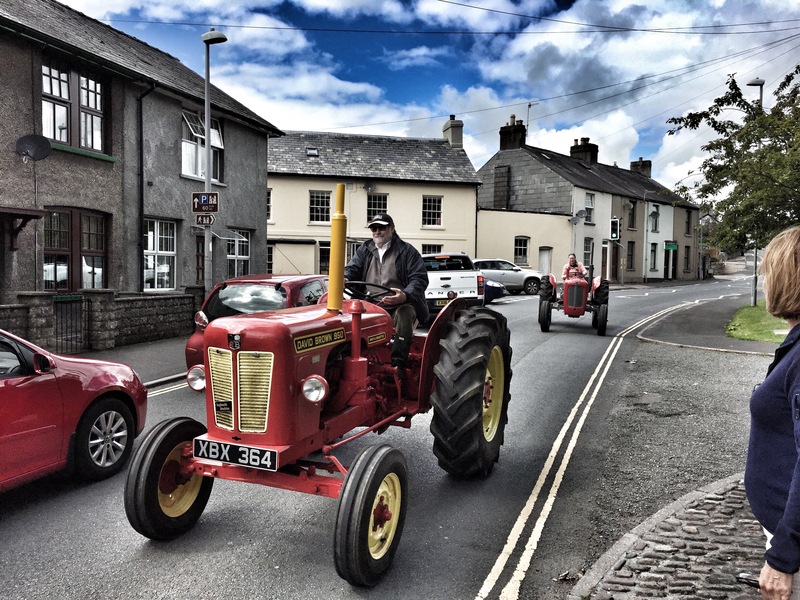 And of course, we have to remember that Brecon is a country town, surrounded by rich farmland. Therefore is obligatory to have a tractor driving down the street. Not only one but two. If you ever have the chance, visit Brecon, but try to do it during the Festival weekend. We be going back to the festival.